The Massachusetts Republican leadership were all there. Several hundred had gathered at the Hotel Brenton near the shores of Bass Point. The year was 1915, and there were many issues to be discussed. Former Governor Foss was there, so was former Congressman Samuel McCall. Talking suddenly stopped as the lights turned down and a single spotlight showed a beautiful young woman who began to dance rhythmically to the sounds of the hidden orchestra. She paused to sing “A Little Bit of Heaven.” The politicians were entranced. The young woman danced up to Former Governor Foss, who had been Governor only a year before, and gave him a kiss on the cheek. She was also going to kiss Congressman McCall, but he raised his hand to his cheek so she kissed his hand instead. She danced away and then sang in her crystal clear voice, “I Didn’t Think You’d Care.” Finally, she danced away. None of the Republicans attending had a clue who the cute young woman was — just a mystery girl. A Boston Sunday Post reporter hunted her down and found out the identity of the mystery woman. It was Donna Montran. According to the story in the Sunday Post, Donna had run away from home when she was 14 and set off to seek fame and fortune. After she left her home in Detroit, she played the juvenile lead in “The Girl and the Keiser” then took on Vaudeville and the Keith Circuit. Fame and fortune didn’t turn the blond beauty and she consciously decided to abstain from drink and avoid partying. 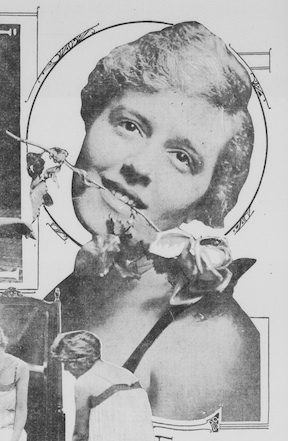 She wrote music and made a small fortune with a vaudeville show titled, “Montran and Drew.” The article goes on to say that Donna will be on tour in the West in a few weeks with her own show, “Donna Montran Summer Girls.” Donna boasted having a home on “Riverside Drive” and two automobiles. She says knows how to fly and she hopes to be able to fly one of the machines in the future. The ¾ page article highlights the “girl who kissed politicians” with five photographs, including the one above. Pingback: Montrans in the News – Female Help Wanted.